Photography is such an expansive subject and it’s quite impossible to cover everything in a single book. Some books focus on very specific topics, but contain in-depth information. Other books are broad, but just skim the surface. Regardless of the style, many informational photography books drone on page after page, leaving the reader in a haze of technobabble and jargon. I received a copy of the Fundamentals of Photography by Tom Ang, and I must admit that I was skeptical of the book before I opened it. I assumed it would be one of those “talk about everything” books with a very shallow offering of knowledge. I was wrong. I don’t know how he did it, but Tom Ang managed to pack an incredible amount of information into this small handbook. Not only is the information valuable, it’s extremely concise and well laid out. The book would be great as a front-to-back read or as a reference book for the occasional information search. Oh, and it covers both film and digital photography! Be sure to read on, we’re giving away a couple copies of the book for free. Fundamentals of Photography (ISBN 978-0375711572) can be purchased directly from the publisher or through Amazon.com. 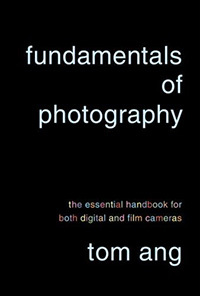 Fundamentals of Photography, the Essential Handbook for Both Digital and Film Cameras, by Tom Ang is 352 pages long with a soft cover. The book contains 11 chapters filled with information and sample photos to demonstrate the topics covered. The chapters include a General Introduction, Fundamentals of Light, The Camera, Capturing Light, Using the Lens, Manipulating Light, Working with Color, Processing the Image, Digitizing the Image, Outputting the Image, and References. Each chapter is broken up into bite-sized sections covering a very specific topic (as the sample above shows). Most of the sections span two pages (across the fold), so the topic can be studied without flipping through page after page — it’s all right there in front of your eyes. 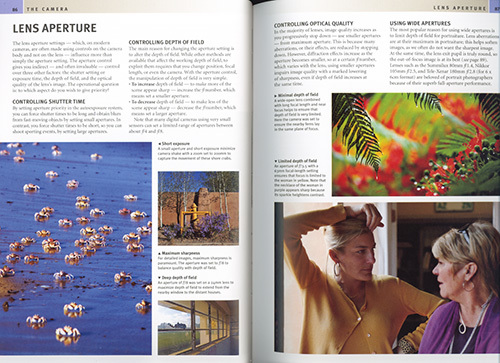 Certain sections are also marked as “advanced topics” aimed at the photographers with some amount of learning under their belt. And finally, there are a couple of “Analysis” sections in some of the chapters that present a full image across the two pages with many notes pointing out things that were talked about in previous sections of the chapter — kind of a “hands-on” lesson. The really cool thing about this book is the fact that it presents material for both digital and film photography. In some cases, similar concepts between the two mediums will be in high contrast. In other cases, the same exact concepts apply to both. This type of content is useful for those wanting to explore the medium they’re not familiar with. It’s also useful as a digital photographer to understand film concepts and how those concepts have transcended into digital. For me, the book showed up at a great time (I just got my darkroom set up and running), and I found myself reading heavily into the darkroom sections along with the deeply technical subject of film in general. 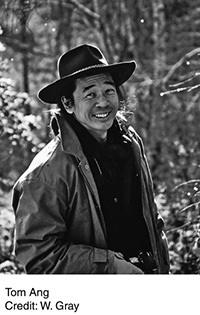 Tom Ang is a seasoned photographer and educator, not to mention an avid writer with nearly 20 books published. His work has been exhibited internationally, and for 12 years he was a Senior Lecturer in Photographic Practice at the University of Westminster, London. He was also the presenter for two six-part BBC programs on digital photography. You can find Tom on the web at his main website and his photography blog. This man has a wealth of knowledge, and I’d suggest you check out his blog articles and any of his books. Knopf Publishing Group is giving away two free copies of the book. All you have to do is leave a comment and let us know you’d like one of them. In one week (December 1, 2008), I’ll choose two random entries and we’ll send the books along. If you don’t see your comment show up immediately, it probably just needs to be moderated. If you don’t see it show up after two days, it probably got attacked by the spam filter. If you want to be sure it doesn’t get eaten, just include the word “fundamental” in your comment and I’ll search the spam box for that word. I like it, definitely. I’m not typically a fan of photography-information books because it’s not usually done well, but I like this one. My main reason for liking the book is because it gets to the point and doesn’t fool around — very concise layout. The other reason I like it is because of the diversity of the subject matter (film, digital, illustrations, examples, technical, non-technical, etc). The book is easy enough for a beginner, but interesting and useful enough for advanced photographers. I don’t really have anything bad to say about the book. Some people might not like the soft-cover, but I think it suits this book just fine (plus it helps keep the price to a ridiculously low number). I could complain that it doesn’t go to extreme depths on every topic presented, but that would defeat the purpose of the book (plus it would be really boring). I would definitely recommend the book to beginners wanting to jump-start their education. I’d also recommend it to the more advanced photographers as a reference. And if you’re interested in learning the ropes of film photography, this book is a good start. This entry was posted in Features, Reviews and tagged book, book review, fundamentals, handbook, photography, reference, review on November 25, 2008 by Brian Auer. i’m trying to rub in my mind the fundamental of exposure. i need this wonderful book! I hearby declare my interest in one copy of this book. please add me to the drawing for the Fundamentals of Photography please. I’ve been meaning to go back to film. I shifted to digital when I was just beginning to get the hang of it. Looks like this books is gonna be useful. Put my name in for the draw, definitely would like a copy of this book. If I don’t win I’ll be looking for it elsewhere for sure. Looks just like the type of book that would help me in the new hobby I have taken up, this would make a great Christmas present for me from you. with all the fundemantal information I would require to become a better photographer. I gave Tom Angs’ Digital Photographers Handbook to my Mum, when she got her first digital camera… Has been a great source of reference to her. Personally, I’d love a copy of this for my book shelf! I’d love to check this book out. The compare/contrast of film vs. digital alone sounds cool. I would love a copy if it’s available. Seems you can never have enough books about photography. Great review. I recently started shooting with a film camera and have not found any good books that cover both film and digital. I would love to have a copy of the book. Well I can see I missed this taking time off for Thanksgiving. I would have loved a book but the time with the family was more than worth it! I have a point and shoot camera and I’m really ready to get a SLR camera, because I am loving photography.. I have been inquiring as to which camera to get and which book may help me.. I was told to go to the book store and see what book I would like. II decided on your book and proceeded to look it up for reviews. I am also learning the computer. I’m 70 years old and starting this wonderful new hobby. I never win anything so if I don’t get picked I guess I’ll go back to Barnes and Nobel and buy one. Hopefully you choose me. It’s great to hear about your newfound passion! As far as the book goes — it’s definitely worth getting. Unfortunately, we’ve already given the free copies out though. I love to have the Book, I will try to search it form local library, I hope I can get it!! !